The offices in Ballymun, Clondalkin and Smithfield will close for a week. 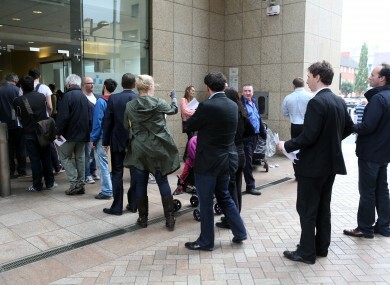 The motor tax office in Smithfield ahead of changes to the non-use declaration system. THE INTRODUCTION OF new credit-card sized driver’s licences and new rules regarding non-use declarations have caused such a backlog that all three motor tax offices in Dublin will close for a week. Dublin City Council has confirmed that the offices in Ballymun, Clondalkin and Smithfield will close to the public next week in order to deal with the backlog. A statement from the council says that there is simply too much to get through with the offices open. “This closure is to accommodate the significant backlog of non use declarations, motor tax applications and driving licence applications as a result of legislative changes introduced from 30 September. Dublin City Council apologises for any inconvenience this may cause. Customers can continue to pay motor tax by post or online at www.motortax.ie. Email “Dublin City Council to close motor tax offices to deal with licence backlog”. Feedback on “Dublin City Council to close motor tax offices to deal with licence backlog”.